Paste tomatoes are meaty and perfect for dehydrating. As soon as the calendar tuns to the new year, gardeners dig into plans for their annual food gardens. They sow seeds indoors under lights well before spring and begin sowing hardier cool season crops outdoors — under protection or not — by early February. And, the sowing and plant coddling continues, daily, for most of the year to come. 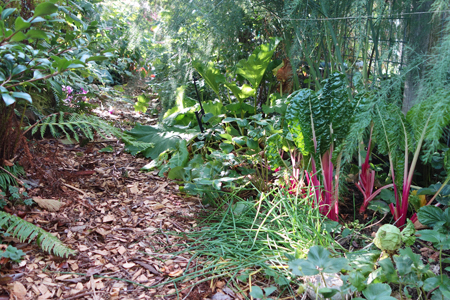 if you choose the right plants like gorgeous, perennial rhubarb. For intensive food gardeners, this repetitive practice is a labor of love. But the repetition of sow-reap-winter-repeat year after year can become more burdensome than rewarding. Sure, you get to harvest tasty tomatoes in summer, but if you prefer to spend your summer days hiking and shopping rather than monitoring delicate crops everyday, annual edible gardening may not be right for you. But, you can still grow food gardens! What so many new gardeners don’t realize and many veteran gardeners may forget is that perennial food crops are so much easier than annual vegetable gardens and they’re generous year-after-year. Perennial food gardens consist of plants that live for many years and yield something good to eat. Some may be herbaceous, meaning their top growth withers for winter. Some may be woody and deciduous, meaning they have sturdy stems but lose their leaves for winter. And, others may be evergreen, meaning they look great all year long. Plus, because these plants become acclimated to the garden, they tend to need less water than thirsty annuals – just be sure to water them well for at least the first three years like you would other perennial plants. Perennial food weeds: Rather than bemoan the weeds that you likely battle, take a different perspective on what it means to have nettles, blackberry and dandelion in your garden. Sure, you might not choose to plant them, but if you have’m, eat’m! 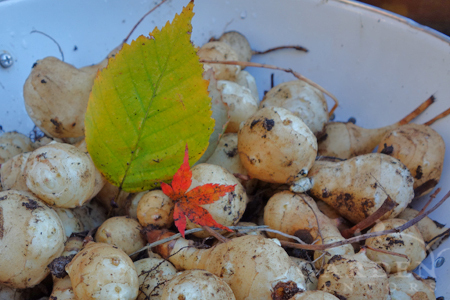 Sunchoke tubers are best harvested after a frost. Plant with caution; they spread rapidly. Groundcovers for foodies: Thyme is simply a must-have in any garden with decent sunlight; this evergreen spreader is a fantastic flavoring too. Sedum may be an acquired taste in the kitchen, but it’s another drought-tolerant spreader. (Before you take a bite, confirm the sedum you choose is a known edible variety.) Strawberry and lingonberry both hug tightly to the ground, remaining mostly evergreen in winter; come summer, both burst forth with sweet, red morsels. 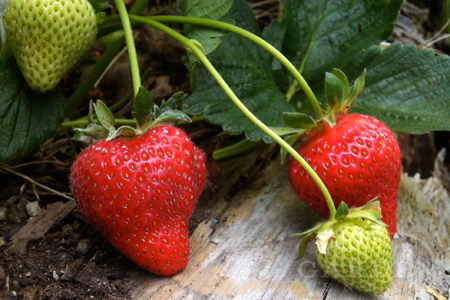 Strawberries make a delicious perennial groundcover crop, but if you’re growing lush berries, don’t think this plant as something to walk on or oops! MUSH! Snackable shrubs: Blueberries and huckleberries are obvious choices. But, don’t forget that drought-hardy woody herbs like rosemary, sage and lavender are also edible, plus they look and smell great in winter too. Tasty tree treats: You may not want to plant a fruit-bearing tree right over your patio. Nobody wants to get knocked on the noggin by a heavy, ripe fruit. That being said, there are many mini-dwarf cultivars of apples, pears and other fruit trees that look great in pots on your deck. If you have room for an orchard, add in fig, citrus, bay leaf, sterile mulberry, almond, hazelnut, walnut or other size and climate-appropriate options. 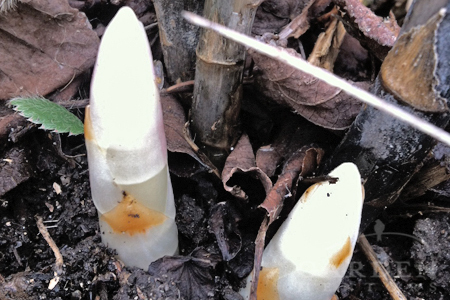 As asparagus pushes up through leaf duff & mulch, the tasty tips are white & extra-tasty. 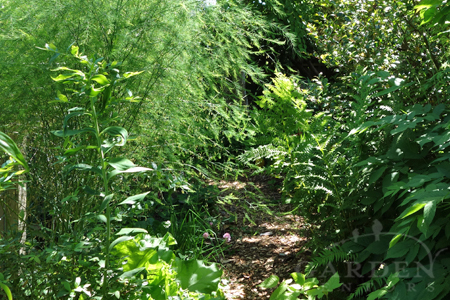 Lovely leaves: Plant come-again asparagus sooner rather than later. Its beautiful, fern-y texture is a gorgeous garden addition. And, thank goodness for that because you really shouldn’t harvest it until it has been growing for at least three years. And, find a spot for rhubarb. Even if you don’t care for the sour taste of “pie plant,” this plant’s large leaves and raspberry-red stems add incredible interest to your garden year after year. Plus, some neighbor will gladly take your harvest off your hands. 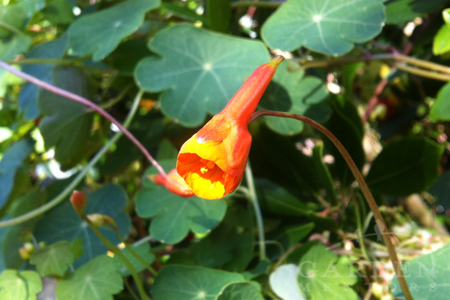 There are many other edible perennial plants for your garden. Need help planning what’s right for you location? Contact us today! Growing a shade vegetable garden really is possible if you choose the right food crops. Trying to cultivate tomatoes or zucchini in deep shade isn’t likely to work, so don’t waste your time failing with those. Instead, try some of these great performers for your dark corners! Chard like this ‘Peppermint Sticks’ variety from Renee’s Garden seeds* performs equally well in deep shade or bright sunlight. Here it is glowing in bright September sunshine. 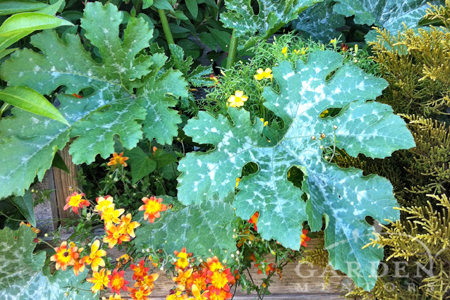 Choose leafy greens like lettuce, spinach, kale or chard for your beds that get the least sun. Then, be sure to time things just right, and you’ll enjoy a long harvest of nutritious green goodness. 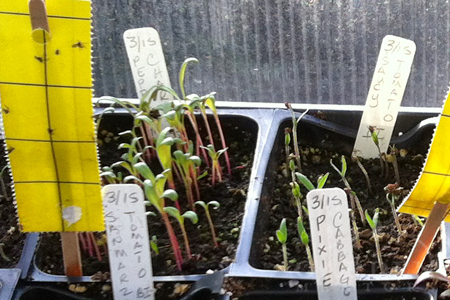 Sowing chard seeds early in the season will give your crop kickstart. Or, direct sow your seeds if your bed is getting some spring sunlight & the soil is warm. Early spring or late summer! Many leafy green food crops will grow quite well in dappled to even deep shade, but it is important that they are exposed to sunlight and warmth during their early stages of growth. 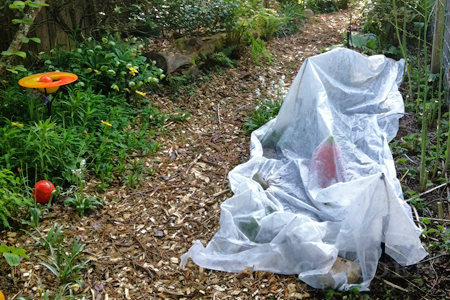 Covering your leafy green starts or seeds with a sheet of horticultural fleece helps protect your food garden from pests like leaf miners & warms the soil to help your crop grow. In early spring, this planting bed gets at least three or four hours of sunlight. But once the surrounding trees and shrubs leaf out and the asparagus and other nearby perennials grow tall, this will truly be a shade vegetable garden bed. And, in early autumn nearby trees begin to shed their leaves, again letting in sunlight so cool season greens below can grow. 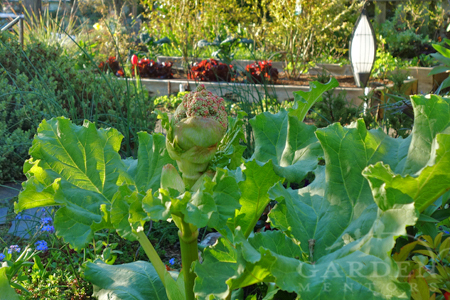 While this bed looks bright & sunny on a hot July day, the chard is growing below the tall, ferny, shade-casting towers of asparagus. This light hardly touches chard in the under-story! Of course, when it is hot and dry, chard and other greens will need supplemental water. Leafy greens will not thrive in dry shade. Seeded in March, planted in April & offering edibles well into September, this brightly stemmed chard is productive in an area that receives only a dappling of sunlight each summer & fall day. Bonus: it adds a pop of bright color to an otherwise dark corner. 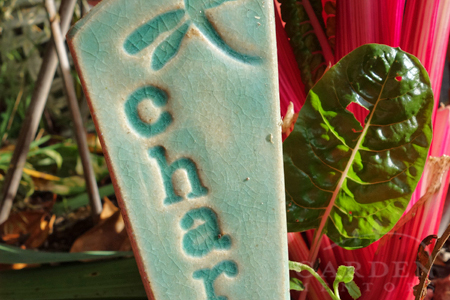 *Disclosure: Garden Mentors has received test growing ‘Peppermint Sticks’ chard & other seed from Renee’s Garden Seed. However, no compensation has been paid for this post or for growing this crop. In the height of the annual vegetable growing season, we see a lot of photo request pleas for what may be blossom end rot. 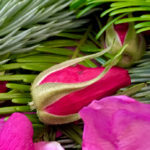 Frustrated veggie gardeners who have worked diligently to get their tomatoes, squash and other edibles to produce flowers and fruits are suddenly dismayed to find these shriveled and blackening flower ends on their crops. Two very common culprits result in the flower-end of your homegrown edibles turning brown and shriveling: blossom end rot and poor pollination. Each has a different cause. Understanding those causes is the key to remedying the issue before the season passes and your entire crop is lost. And, yes, there are ways to get past both problems during the growing season. And, there are ways to keep them from repeating in the future. Here are two zucchini fruits. The tiny one is shriveling due to poor pollination, not blossom end rot. 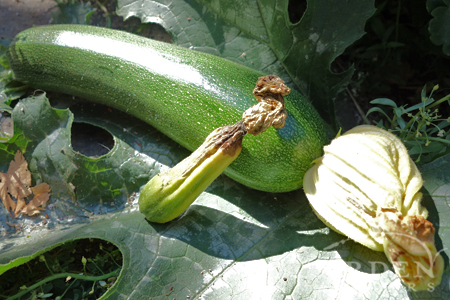 The large one was well pollinated, resulting in a rapidly growing squash fruit. When fruits like these paste tomatoes are pollinated & maturing & then the bottoms begin to turn black, that’s blossom end rot. 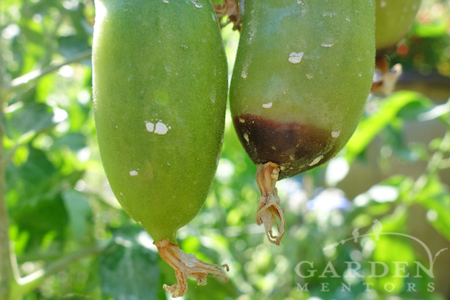 Not every end-rotten tomato in a cluster or on every plant will show this way. Sometimes you’ll cut into a ripe fruit only to discover the rot. Dang it! Knowing why and how to thin apple tree fruit (and other tree fruits) is important to producing a better harvest. It may seem counterproductive to take several fruits off of your pollinated tree, but pruning out crowded clusters of young fruit actually does a few good things for your trees and your crop. 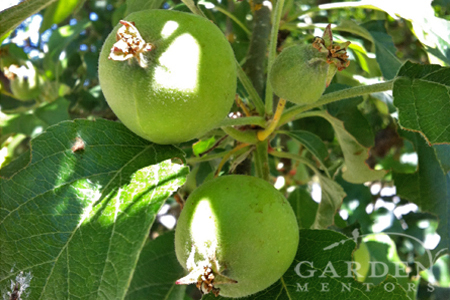 In late spring/early summer, check apples, pears & other fruit trees for young fruit clusters. Then begin selecting for the best in each cluster. Fruiting trees often produce an abundance of flowers to ensure some are successfully pollinated. However, if all of the flowers are pollinated, which leads to fruit production, trees may not be able to access sufficient resources to convert every one of those fruits into big, juicy edibles. And, if branches are over-burdened by an over-abundance of developing fruits, they may become stressed and may break under the weight. So, it’s important to both reduce each crowded cluster from several fruits to just one or two and to be sure individual fruits that remain are well spaced on branches, which helps disperse the weight maturing fruit adds. Begin thinning young tree fruit clusters by removing the smallest fruits in any group. These aren’t likely to mature and sap resources during the growing season. By manually removing any of the smallest, most damaged or withered of these young fruits early in the season, you will help your fruit tree divert its limited resources to a small number of remaining fruits. Yes, you will harvest fewer individual fruits, but those you do harvest should make for better eating since they will benefit from growing space and more sweetening feeds from the tree. 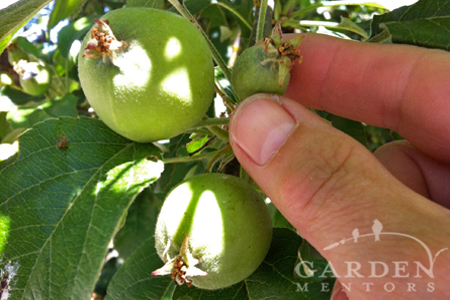 Not only are the smallest fruits ideal to remove, but taking out damaged or poorly formed young fruit like this one keeps the tree from wasting resources on it. 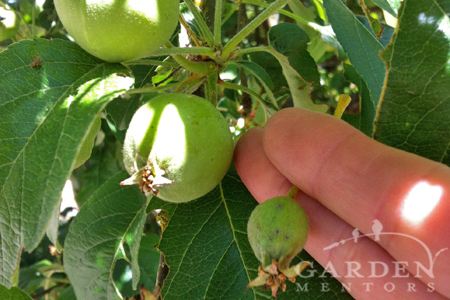 Left to their own devices, by early-to-mid-summer, many trees will drop a number of immature fruits on their own. But, the tree may release more of the fruit you would choose to keep, so make your own selections and hope the tree doesn’t over-ride your choices later. And, if you haven’t protected your fruits from apple maggot and coddling moth, learn how to do that here. This is NOT powdery mildew. Rather, the slivery-white streaking & splotching radiating out from the veins of this zucchini leaf are natural coloring. It’s not disease! This spaghetti squash leaf is heavily coated in powdery mildew. The powdery-whiteness does not radiate from the veins of the leaves. Instead, it begins as spots on both sides of the leaf. Left in place, the entire leaf will be covered & eventually the entire plant will go ka-put. 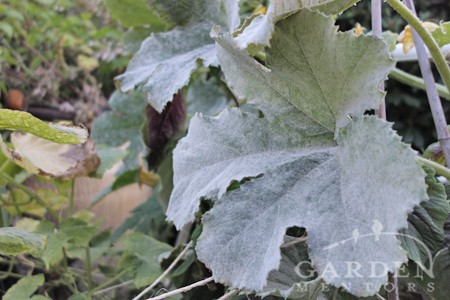 Learn how to identify early infestations of this common squash problem and learn how we manage powdery mildew on all sorts of plants in this related post.